WDCS, the Whale and Dolphin Conservation Society today welcomes new proposals for large areas of protection in the Mediterranean and Black seas for some of the world?s most threatened whale and dolphin populations. Within the proposals, important areas for feeding, breeding and rearing young used by fin, sperm, Cuvier?s beaked and killer whales as well as bottlenose and common dolphins and harbour porpoises are highlighted for protection from encroaching industry and pollution. ?These proposals are based on solid science and are some of the most far-reaching and significant to be recommended in European waters,? says Erich Hoyt, WDCS Senior Research Fellow. ?They aim both to protect critical marine ecosystems as well as to reduce persistent threats to the whales and dolphins and the species and habitats they depend on.? The proposals are being formally recommended to the 20-country parties to ACCOBAMS (Agreement on the Conservation of the Black Sea, Mediterranean Sea and contiguous Atlantic area) by the ACCOBAMS Scientific Committee at the Meeting of the Parties later this year. WDCS calls on these countries to start the process to protect these areas. Most far reaching of the plans is the inclusion of the entire Albor?n Sea and Straits of Gibraltar (approx. 25,000 sq km), with substantial portions of the national waters of Spain and Morocco as well as the adjacent high seas. This region is the most productive and diverse area in the Mediterranean and features 10 of the Mediterranean?s whale and dolphin species in high numbers. Yet the area is under intense pressure from fishing, including illegal driftnet fishing, as well as shipping traffic, and maritime pollution. 1. The Strait of Sicily (an area frequented by fin whales and various dolphins off Italy, Malta and Tunisia and on the high seas). This area requires further study to determine cetacean critical habitats and threats, and to identify appropriate boundaries. 2. Amvrakikos Gulf (NW Greece) where about 150 bottlenose dolphins live in a semi-enclosed area which could function as a natural laboratory for research. 3. 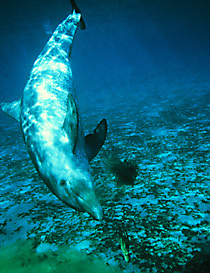 Two areas important for Black Sea dolphins and harbour porpoises. 4. Eight areas for common dolphins in the Mediterranean (5 in Greece, 2 in Italy, as well as the Albor?n Sea, already mentioned). Erich Hoyt, WDCS Senior Research Fellow, helped organize a scientific workshop on specially protected areas last November in Monaco that examined and put forward the proposals through the scientific committee of ACCOBAMS (Agreement on the Conservation of Cetaceans of the Black Sea, Mediterranean Sea and contiguous Atlantic Area).
? The area highlighted for protection in the Albor?n Sea and Straits of Gibraltar is being proposed in a number of Special Areas of Conservation and Ocean Reserves, as well as an international SPAMI (Special Area of Mediterranean Interest) under the Barcelona Convention whose signatories include most Mediterranean countries.
? 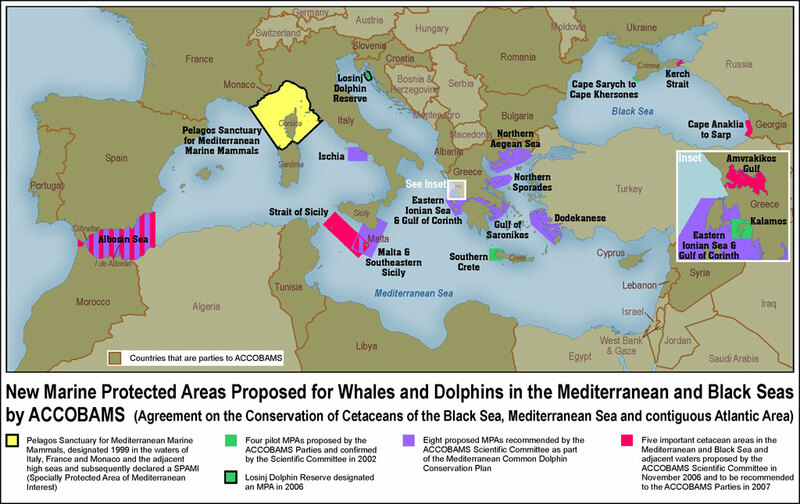 Except for the Albor?n Sea proposal, the new MPA proposals do not include the vast southern and eastern shores of the Mediterranean due to lack of knowledge; this will be the next frontier for ACCOBAMS work on cetaceans and protected areas.
? For a special map of the newly designated areas prepared by cartographer Lesley Frampton, see above (for a high-res copy, contact erich.hoyt<at symbol>mac.com). The map may be published for free, with credit and copyright notice: Map by Lesley Frampton, ? WDCS 2007. Fran Mallion, WDCS Press Assistant, on 01249 449 534 or 07834 498277, or email fran.mallion<at symbol>wdcs.org.